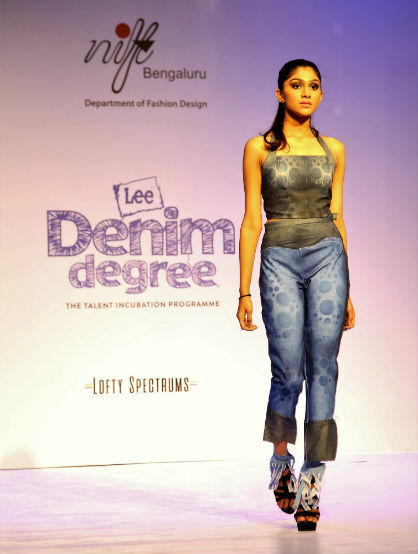 Bengaluru: Lee, the iconic denim brand with over 128 years of rich heritage has been synonymous with ‘innovation’ in the world fashion! With immense wealth of research and learnings, Lee associated with National Institute of Fashion Technology (NIFT), Bangalore one of the best design schools in the country, conducted a one of its kind Talent Incubation Programme – ‘A DEGREE FOR DENIM’ at the NIFT Campus. As a part of this talent incubation program, Lee reached out to the final semester students from the fashion institution to impart the philosophy and concept behind the brand’s latest range of denims – Body Optix and the concept of vision science which was used to create these latest range of denims. Designers from Lee, together with their global vision scientists, have studied how the human eye perceives key features, and leveraged precision patterning, contouring and shading techniques to create a 360-degree enhancing optical illusion. 34 students of the final year batch were mentored by Lee on the concept of Vision Science and they were given a brief design outfits using the principles of vision science and they need to also use some amount of denim in their outfits. The designs were displayed through a scintillating fashion show at the NIFT campus today. The winning design by Rupika Goyal was based on the concept of vision science that made use of polka dots. The design was chosen by the esteemed jury comprising of Mr. Puneet Khosla, Managing Director, Lee India, Prof. V. Sivalingam Director, NIFT Bengaluru and Prof. C.A Rayan Project Co-ordinator Lee Denim Degree Finale 2017. Rupika Goyal the winner received a certificate and a gift hamper from Puneet Khosla, Managing Director, Lee India and Prof. V. Sivalingam Shiva, Director NIFT, Bangalore. The iconic denim brand, reached out to the talented final semester students from the fashion institution to impart the philosophy behind its latest women denimwear range – BODY OPTIX TM and the concept of Vision Science. Lee has also mentored these students and educated them about design aesthetics to strengthen the culture of innovation in designs. The students showcased their designs through an impressive fashion show at NIFT.